BDP is delighted to announce Katie Holten’s residency at Büro BDP. We will celebrate on Saturday, June 13, 2-8pm with a Prologue – an introduction to her artists book About Trees. Drawings and prints related to the making of the book will be available for browsing and for sale. Holten is making a series of four, limited edition, offset prints based on her iconic Tree Drawings. 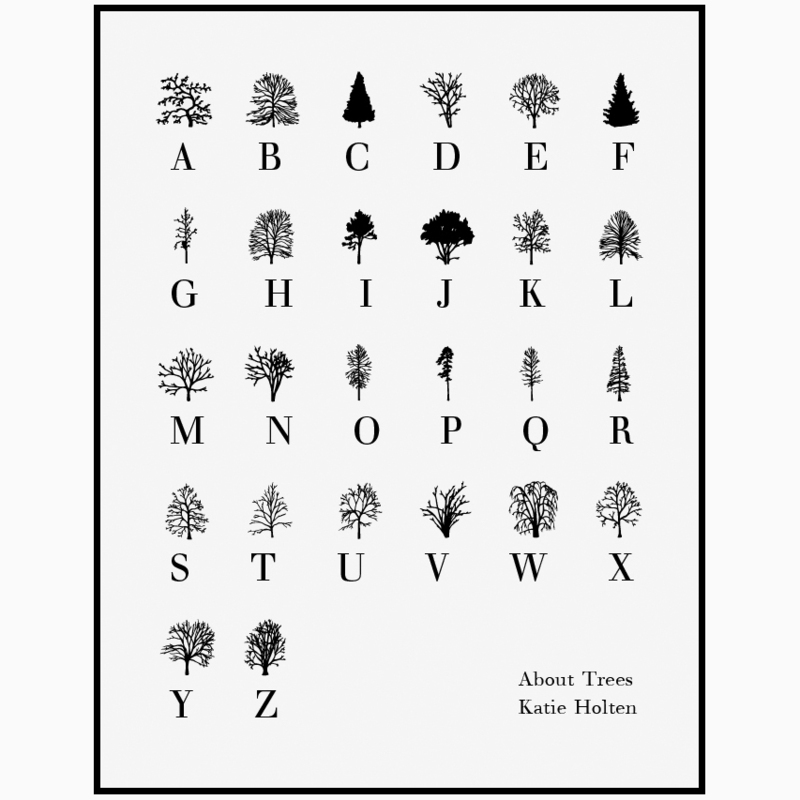 The first print in the series is Tree Alphabet, a poster presenting the ABC of Trees, a unique typographic font that saw Holten collaborate with freelance designer Katie Brown to render her drawings into a workable typeface. During her residency at Büro BDP, Holten has worked with Die Druckwerkstatt in Kreuzberg, Berlin to create the fist ever print edition of her drawings. This summer BDP and Holten are offering these original Tree Drawings and prints for sale to contribute to the costs of the production of the artist book About Trees. About Trees is an artist book by Katie Holten. It will be the first book in BDP's new series: Parapoetics - a Literature beyond the Human. Holten has created an alphabet from her tree drawings and made a new typeface called Trees. Registering a crisis of representation, About Trees considers our relationship with language, nature, information, drawing, ecology, memory, systems, and time in the Anthropocene. Texts by Jorge Luis Borges, Inger Christensen, William Corwin, Charles Darwin, Nicole Davi, Tacita Dean, Brian Enquist, Amy Franceschini, Charles Gaines, James Gleick, Fritz Haeg, Amy Harmon, Natalie Jeremijenko, Eduardo Kohn, Elizabeth Kolbert, Irene Kopelman, Ursual K. Le Guin, Ada Lovelace, Robert Macfarlane, E.J. McAdams, Arianna Occhipinti, Katie Paterson, Thomas Princen, Pedro Reyes, Robert Sullivan, Rachel Sussman, Nicola Twilley, Gaia Vince, Aengus Woods, and others.